IBM yesterday announced that Polaris Financial Technology has selected IBM Connections to provide employees with a top notch digital experience to improve workforce productivity and accelerate business growth. By adopting IBM’s leading enterprise social collaboration platform, Polaris FT is transforming how its 12,500 employees connect, communicate and collaborate to drive greater workforce productivity. Instead of relying solely on email to drive essential business tasks and project coordination, the new platform allows Polaris FT to leverage the collective knowledge of every employee to fuel new innovation, ideation and future business growth. This includes a significant reduction in the time it takes to on-board employees new to the company. So how did they do this? 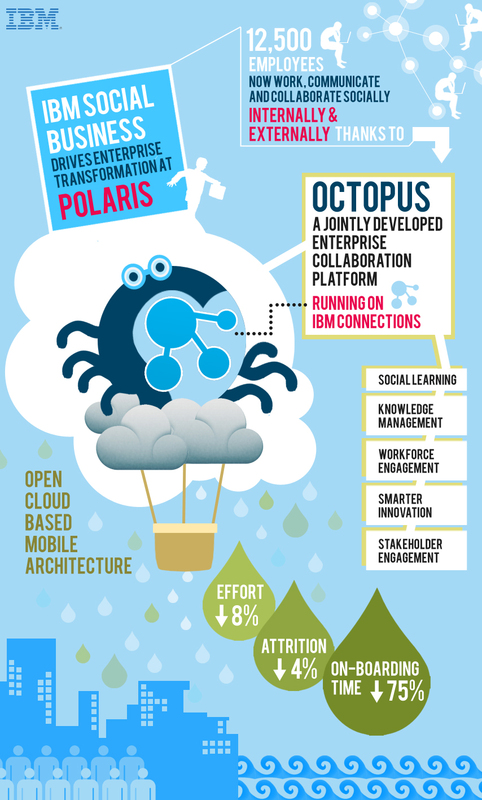 Working with IBM, Polaris designed and developed Octopus, an enterprise social platform that runs on IBM Connections and uses APIs provided in the IBM Social Business Toolkit. This application makes it easy for IBM partners and clients like Polaris to build an entirely new class of cloud-based social business applications for their businesses using the Connections foundation. With Octopus, Polaris is able to apply social networking, social learning, digital experiences and knowledge/content management tools based on an open cloud-based, mobile architecture. This session will show you how to explore the Social API’s that are provided by IBM Connections. You will see the API’s running live in the Cloud. You will also learn about the building blocks that can be reused to add social features to your own applications. Finally you will see a demonstration of how an existing application has been extended to include social features. To register for the developer webcast, click here. And that's not all! IBM Connections Next is just around the corner so don't forget to register for the webcast on May 21 to learn more about what's coming in IBM Connections Next.